Ronald Arbuthnott Knox was born at Kibworth Rectory on 17th February 1888, son of the local vicar, Edmund Knox, and his wife, Ellen. He was almost destined to serve the church as both of his grandfathers were Anglican bishops, and his father went on to become Bishop of Coventry and Bishop of Manchester. He was educated at Eton, where he was Captain of the school in 1906, and then Balliol College, Oxford, before becoming a Fellow of Trinity College. In 1911 he was ordained an Anglican deacon and in 1912, chaplain of Trinity College. He taught at Shrewsbury School and, during WWI, served in Military Intelligence. Knox had considerable difficulties with the Anglican faith and, in 1917, converted to Catholicism, becoming an ordained priest in 1918. He taught at St. Edmund's College, Hertfordshire, from 1919 to 1926, and from 1926 to 1939 he was a chaplain to Catholic undergraduates at Oxford University. He was a mentor of Harold Macmillan. In 1939, at the request of the bishops of England and Wales, he returned to Shropshire to translate the Vulgate, the official version of the Catholic Bible that had been used for many centuries. He published his translation of the New Testament in 1944, and the Old Testament between 1949 and 1950. The complete translation was finally published in 1955 but, although it was well-received, the Church decided to abandon the Vulgate and go back to the original Greek and Hebrew. In addition to having numerous books and essays published on theology, Ronald Knox was a prolific writer of detective stories and had many books published, including: The Viaduct Murder (1925), The Three Taps (1927), The Footsteps at the Lock (1928), The Body in the Silo (1933), Double Cross Purposes Still Dead (1934). He regularly broadcast on the BBC and, in 1926, broadcast a spoof that fooled the country and probably influenced Orson Welles with his famous War of the Worlds broadcast in 1938. Knox’s Broadcasting from the Barricades reported on a revolution sweeping across London, and included ‘live’ reports of a government minister being lynched, the Savoy Hotel being destroyed by mortars, the destruction of Big Ben and the Houses of Parliament. The broadcast took place over a snowy weekend and many people were unable to get newspapers until several days later. The lack of newspapers caused a minor panic, as many thought this had been caused by a revolution in London. “A baby is a loud noise at one end and no sense of responsibility at the other”. “A good sermon should be like a woman's skirt: short enough to arouse interest but long enough to cover the essentials”. 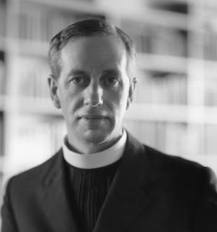 Ronald Knox died on 24th August 1957 and is buried at St Andrew's Church, Mells, Somerset. Siegfried Sassoon, the WWI poet, requested that he be buried close to Ronald Knox.